Brazilians have long appreciated passionfruit, a tropical fruit that is extraordinarily blendable with other fruits. Brazil grows more passionfruit than the rest of the world combined, yet Brazilians love it so much that they are net importers of passionfruit purees and concentrates. Very low concentrations of passionfruit deliver exotic tropical taste at very low concentrations, making it an economic ingredient in-use. Even in Europe, demand for passionfruit concentrate is five times US demand, even though it offers compelling benefits for the American consumer. Every significant brand in Europe has a prominent passionfruit based beverage and a well-known multi-vitamin product in Europe (one of their most popular beverages) includes passionfruit. Europeans have been enjoying passionfruit for more than 30 years as an essential flavor in the beverage industry. Yet passionfruit offers compelling benefits for the American consumer as well. Passionfruit use is steadily growing in the US as well. The market is beginning to recognize the many benefits of using passionfruit in in products ranging from beer to smoothies, vegetable blends to premium 100% juice blends. It also grows in our own "backyard" in Ecuador and Peru. Why Passionfruit? Health benefits, Flavor Profile and Acidity. Fruits and vegetables are important components of a healthy diet. Passionfruit is nutritionally rich. Not only does it contain dietary fiber, 40% single-strength passionfruit is an excellent source of vitamin A and a good source of potassium. Like many fruits, is low in sodium and is free of saturated fat or cholesterol. Passionfruit provides essential plant-based antioxidants in the form of phytochemicals, such as carotenoids and polyphenols, both of which are found in abundance in passionfruit juice. 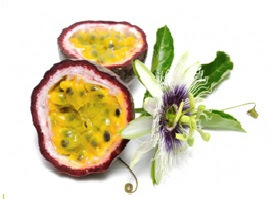 Beside the health benefits, why consider using Passionfruit? Passionfruit has the unique and remarkable ability to mask less expensive filler juices and even negative-tasting ingredients with its intense flavor. This provides the ability to produce better tasting end products with less expensive materials. Additionally, passionfruit compliments other fruits quite well. It is known to assimilate well with mango, banana, and pineapple. These fruits have strong characteristic flavors that often do not compliment easily. Passionfruit itself is also naturally intense, so the actual amount of concentrate required is minimal, making it a relatively inexpensive ingredient for drinks and other applications such as yogurts, ice cream, water ice, sorbets, sauces, salad dressings, and teas. Also, due to its relative high acidity, passionfruit can promote additional shelf life to beverages, also enhancing cost effectiveness. Passiflora edulis, more commonly referred to as Passionfruit, is generally believed to be native to Brazil where 16th Century Spanish Catholics named it "Flor de las cinco llagas" or "flower of the five wounds" after its distinctive purple flower. They adopted it as a symbol of the death of Christ, the Passion. However, despite its religious name-origin, Passionfruit is enjoyed by everyone and is grown in nearly every tropical region of the world. Passionfruit is a unique, colorful, egg-shaped fruit. It is a characteristically flavorful, aromatic, and refreshing tropical fruit which makes it the ideal ingredient for a number of sophisticated applications as well as traditional applications. Passionfruits contain numerous small, black wedge-shaped seeds that are individually surrounded by deep orange-colored sacs that contain the juice, the edible part of the fruit. It is this juice, which is naturally concentrated, that is extracted and further concentrated. Passionfruit is botanically part of the Passifloraceae family and are a close relative to violets. There are more than 500 species in this family and more than 50 of them are edible. Only two varieties, purple passionfruit and yellow passionfruit, are grown commercially. The purple is grown only in small quantities and is generally sold as fresh fruit. The primary plant used for producing juice and juice concentrate is the yellow variety, Passiflora edulis f. flavicarpa. Fruit of the yellow passionfruit is deep yellow and similar in shape but slightly longer than the purple passionfruit. Passionfruit frozen concentrate has a premium flavor and reduces shipping, storage and logistic costs. Clarified frozen passionfruit concentrate delivers the same bold taste but without the pulp. Passionfruit aroma (also called essence) is a FTNF (from the named fruit) natural flavor that need not be listed separately on the label from other passionfruit ingredients in instances where more flavor is desired. Passionfruit aroma is the way to achieve success without adding color or acidity. 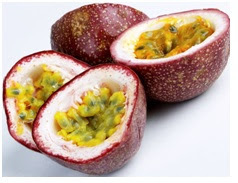 For more R&D ideas and Technical inputs for using passionfruit contact our R&D team at iTi Tropicals.